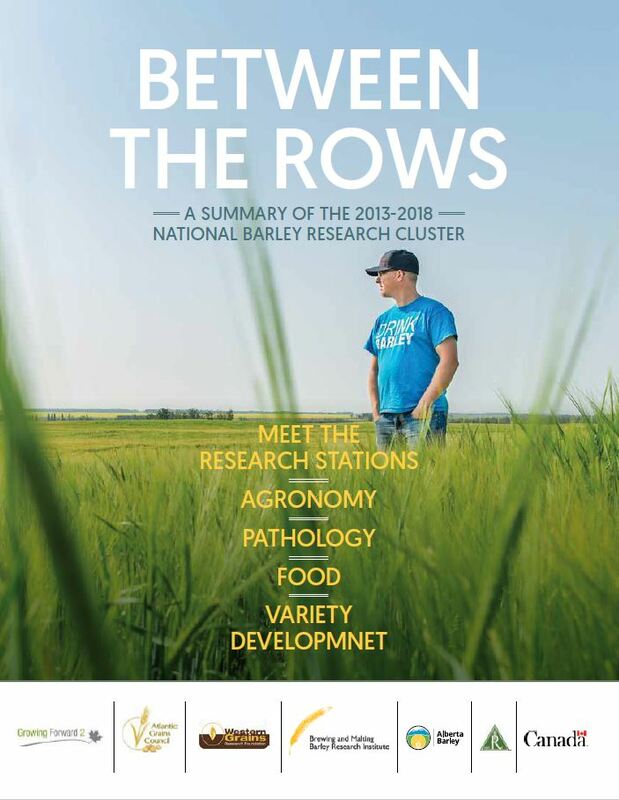 In 2013, Agriculture and Agri-Food Canada (AAFC) announced an $8 million-dollar investment in the barley industry to fund Barley Research Cluster projects via the AgriInnovation Program (AIP) under Growing Forward 2, a federal, provincial, territorial initiative, aimed at increasing agri-sector competitiveness and sustainability. This investment leveraged an additional $3 million from Alberta Barley, the Atlantic Grains Council, the Brewing and Malting Barley Research Institute, Rahr Malting and the Western Grains Research Foundation. Funds were administered by Alberta Barley. Barley Cluster funding covered 28 projects that met industry priorities for feed, food and malt barley. These projects were specifically directed at the development of more competitive agronomic packages for farmers, disease prevention and management, breeding high performing varieties and strengthening end-use characteristics. In Between the Rows, you’ll find an overview of some of the major highlights, success stories and new varieties that came as as result of this important funding initiative.